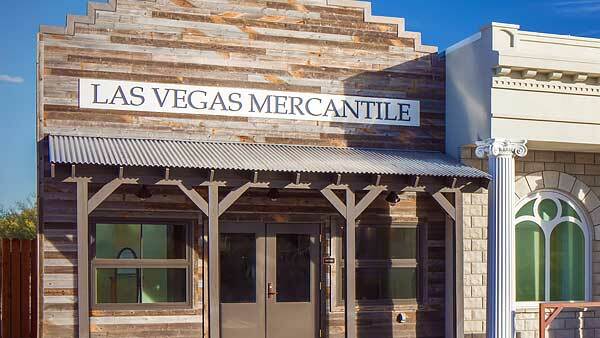 Early Las Vegas was a rapidly changing place for the hardy souls who chose to settle here. 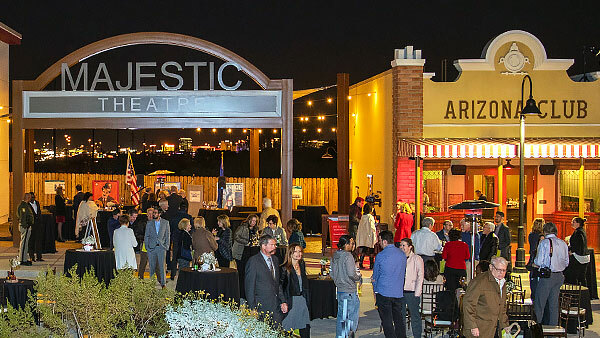 Meet the faces and places of the past at Boomtown 1905, a re-created historical streetscape that tells the story of Las Vegas from 1905 to 1920. We invite you to stroll the street and learn more about Las Vegas’ humble beginnings through engaging interpretive exhibits. Boomtown 1905 is open from 9:30 a.m. to 4:30 p.m., daily. Entry is included with your general admission ticket or Preserve membership. 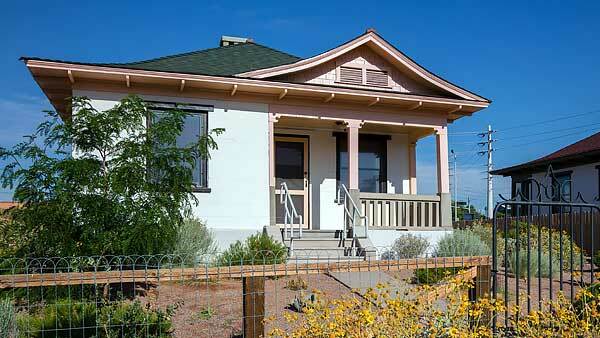 Get a sneak peek at Boomtown 1905 before you visit! 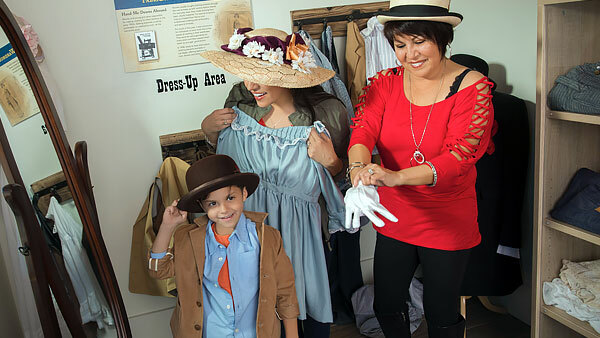 Explore the various scenes, exhibits and activities that can be found on display at our Boomtown 1905 attraction. Boomtown is a fun way to host an uncommon event! Ready to reserve? Have a question? Submit our Venue Rental Request Form or call us at 702-822-8779. 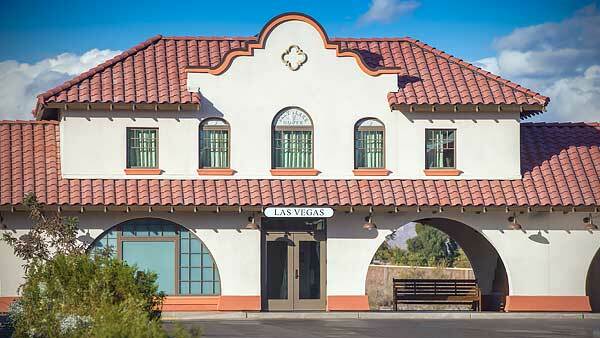 See four original railroad cottages moved from Downtown Las Vegas to the Springs Preserve and tour one restored to its original pre-1911 condition. Learn how the railroad transformed Las Vegas from a dusty desert watering stop to one of the world’s most exciting destinations. Here you’ll also be able to try your hand at sending a message in Morse Code using a telegraph machine, use a train whistle to alert townspeople, and catch up on the news of the day at a vintage newsstand. 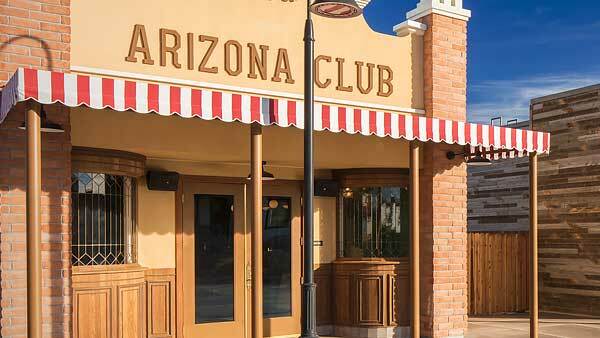 Take a spin at Roulette at the re-created Arizona Club. Located in Block 16, Las Vegas’ “red light” district, this saloon was the most famous in town for much of its history. Try on the fashions of the day and peruse home furnishings, food, hardware and other provisions at the town general store. Plus, learn to weigh mercantile goods and use a vintage cash register to ring up purchases. 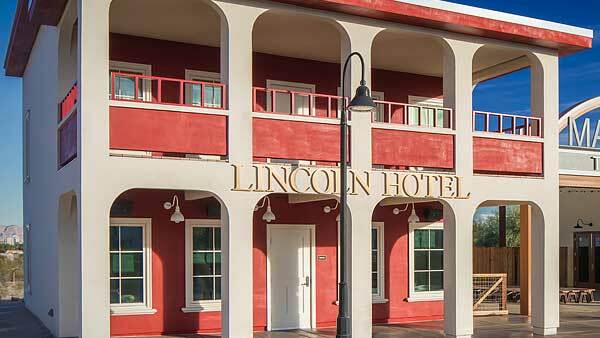 The Lincoln Hotel was one of the first permanent hotels constructed in Las Vegas. Come check out the luxurious accommodations of yesteryear and “check in” the old-fashioned way by signing your name to our register. 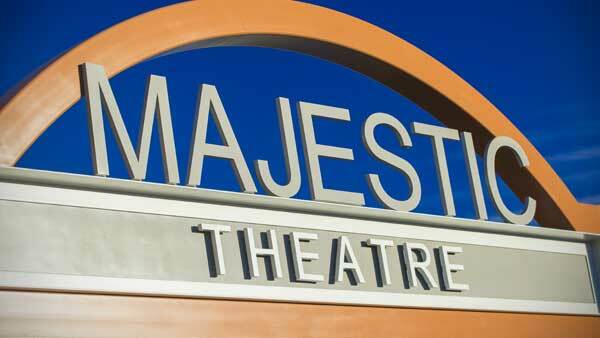 Come one, come all, to the Majestic Theatre! View vintage movie posters at this outdoor replica. Learn about the early days of banking and cash in precious metals just like miners of the time did! 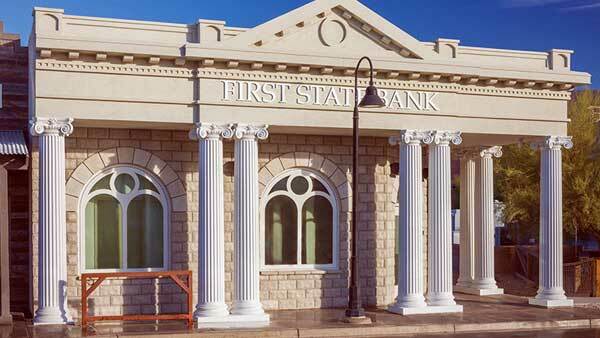 At the First State Bank activity station, you’ll be able to weigh and price out copper, silver and gold metal samples, which can be redeemed at the Nature Exchange for fool’s gold. How do I get to Boomtown 1905? Walk: Once inside the Springs Preserve, Boomtown 1905 is a quick .25 mile (approximately 1200 ft.) walk north starting at the trailhead on the Exploration Loop Trail. Take the train: If you prefer riding to walking, we have two train options. Boomtown “transfer” tickets: If you just want to visit Boomtown 1905, and don’t want to explore the rest of the trails via train, roundtrip train transfer tickets are available hourly, starting at 9:30 a.m. daily, with the last transfer leaving Boomtown at 4:30 p.m. every afternoon. Train transfer tickets cost $2 per person for non-members. Members of the Springs Preserve ride for free. Full-length train rides: In addition to Boomtown 1905, full-length train rides also visit historical and archaeological sites and native habitats along the trails. Full-length train rides are available every day at the start of every hour from 11 a.m. to 2 p.m. (and at 3 p.m. on weekends.) All-day train ride tickets are $3 for value members and $5 for non-members. Bronze and above members receive free year-round train rides. Train ride and train transfer tickets are available for purchase at the main ticket window, the trailhead, and the Arizona Club. Please note that the train schedule is subject to change based on weather, road conditions and special event availability. This exhibit has been made possible with generous support from the following organizations: U.S. Department of the Interior, U.S. Bureau of Land Management, City of Las Vegas, National Park Service, Nevada State Historical Preservation Office, State of Nevada Commission for Cultural Affairs, Springs Preserve Foundation, Wells Fargo Foundation, J.A. Tiberti Family, and the Cashman Family Foundation. Remember your Boomtown visit with a vintage-inspired plush—or read about Las Vegas' beginnings in Under the Cottonwoods.